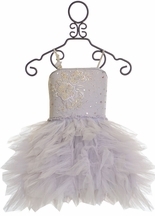 Ooh La La Couture offers show stopping girls party dresses for tweens and little girls. Perfect for her birthday party, father daughter dances and holiday pictures too. A special occasion dress she will want to wear again and again. Pair it with ballet flats or ballet slippers for a classic look or funky fun with a high top shoe or boot. An Ooh La La Couture Spring dress just for her! My little princess is obsessed with everything covered in sparkles, tulle, flowers, sequins, bows, and more! If it is incredibly girly, my daughter will simply adore it. My daughter loves to look like a ballerina and a princess, and they help her to achieve that exact look! 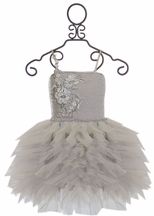 Whether she dancing around the house, going to school, attending a special occasion event, or performing onstage, Ooh La La Couture has the perfect dress for my daughter! The brands full skirts with sparkling sequin and rhinestone covered bodices, making it perfect for not only her favorite special occasion events, but also for her everyday life. The best part about their boutique party dresses is the fact that they are designed with my princess active lifestyle in mind. She is a busy little lady who always wants to look fabulous, so I turn to this brand to help her look as sassy and classy as she feels! One of our favorite things while many of the dresses are covered in tulle and absolutely beautiful to look at, they are incredibly easy to wear! My daughter loved the dresses with denim tops and flowing tutu skirts. They looked incredible for school and for low-key special occasions like friends birthday parties and family get-togethers. But our go-to special occasion dress favorite is the Devin High Low Dress. My daughter adores being decked out in full tulle skirts with sparkly, Swarovski studded bodices. Every time she puts on one of her Devin dresses, she looks like the princess of her dreams! If you ask me, this dress makes her look just like she stepped right off the Fashion Week runway. Something else I love about elegant dresses is that no matter what dress you are wearing, you can completely change its look just by switching up the style of shoes you wear with it. My daughter loves to pair her bright, sparkly high tops with some of her favorite dresses from the brand and it instantly makes the dress a little more casual. For weddings, dances, and other big parties, she will often don a cute pair of Mary Janes or sparkly sandals with her dress for a more formal look that still allows her to comfortably dance the night away! 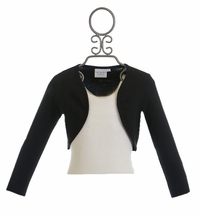 A classic cropped jacket and bolero is perfect for dressing up or down any of their dresses. 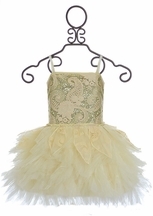 We have invested in many of these simply to give my daughter more ways to wear her beautiful and girly dresses! 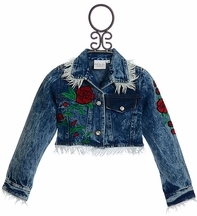 She loves the denim jacket, and it goes with absolutely everything! She even wears it with some of her more casual outfits. The boleros are some of the simplest pieces in her closet and she wears them with everything! In the winter, she often wears them over her dresses with tank styled bodices so that she can wear them year round. Sometimes if she is trying to dress up a simple tank top or add a little bit of extra color to her outfit she will put on a colored bolero or shrug and add a pop of color! But some of her favorite accessory pieces are the ruffled tulle shrugs from the brand. She loves to find them in colors that coordinate with the color of the full tulle skirt and wear the ruffled tulle shrug when she wants to look extra dressed up for an event. School dances are often the most coveted occasion for my daughters ruffled shrug. Some of our absolute favorite pieces have been the Fourth of July styles. Last year, my daughter sported a patriotic themed tutu dress with large sequined stars decorating the bodice and she told me she felt like an American ballerina. She twirled around for hours and danced and jumped with her sparklers while we watched the fireworks and celebrated Americas birthday. She wore the dress with a beautiful pair of red sandals which she absolutely loved. She also paired the dress with her incredibly cute cropped denim jacket when night fell and it began to get chillier. When it was time for her to go to bed at the end of the day, I had the hardest time getting her out of the dress to change into her pajamas! A spectacular feature is many of the dresses have adjustable shoulder straps that will allow for my daughter to wear them for at least a year or two as she grows. The skirts are often long and flowing, so I don�t have to worry about them becoming far too short for her to wear them. The flowing, modern styles of the dresses are absolutely beautiful and timeless. While we will absolutely turn to Ooh La La Couture when we go to find a new dress for any occasion, we will also be able to wear our older dresses for a long time. I have never seen my daughter as happy in an article of clothing as I have seen her in her party dresses. Her smile when she wears her sequin bodices and fluffy tulle tutu skirts brings a warm feeling to my heart that nothing else can replicate. Being able to see my daughter look just like the princess she feels she is, is an absolutely wonderful thing and I only have Ooh La La Couture to thank. If you have a beautiful little princess let her dress like the princess you already know she is.